Directors – Clyde Geronimi, Hamilton S. Luske & Wolfgang Reitherman, Story – Bill Peet, Based on the Novel The One Hundred and One Dalmatians by Dodie Smith, Music – George Bruns, Orchestration – Franklyn Marks, Songs – Mel Leven, Animation Supervisors – Marc Davis, Ollie Johnston, Milt Kahl, Eric Larson, John Lounsbery & Frank Thomas, Special Processes – Ub Iwerks & Eustace Lycett, Production Design – Ken Anderson. Production Company – Disney. The dalmatian Pongo decides that his master, songwriter Roger Radcliffe, needs a mate. Pongo finds the perfect prospect in Anita who is walking her female dalmatian Purdy in Hyde Park and contrives to entwine his and Purdy’s leashes together so that Roger and Anita meet. Roger and Anita duly marry. Pongo also falls for Purdy and not long after Purdy delivers a litter of fifteen pups to him. However, the pups are wanted by Anita’s friend Cruella DeVille. When Roger refuses to sell them, Cruella has them abducted and thrown in with eighty-four other dalmatian pups that she intends to have skinned to make a fur coat. Using a linked network of canine howls, Pongo and Purdy locate the dalmatians and set out to rescue them from Cruella’s clutches. One Hundred and One Dalmatians was the last worthwhile animated film made by Disney Studios within Walt Disney’s lifetime – unless one counts the animated scenes in Mary Poppins (1964). Indeed, One Hundred and One Dalmatians was really the last worthwhile animated film that Disney made for 25 years – until at least The Great Mouse Detective (1986). From the 1960s and throughout the greater part of the 1970s, the directorship of Disney animation was taken over by the Wolfgang Reitherman who reduced Disney’s great artistic heights to an insipid banality, while elsewhere Disney’s live-action division came to supersede Disney’s animated output for the better part of the next two decades with the various Merlin Jones, Dexter Reilly and Herbie the Love Bug films. One Hundred and One Dalmatians is a rather engaging effort. It is an attempt to reduplicate the talking animals romantic fantasy that Disney did so well with Lady and the Tramp (1955) several years earlier. It still works well here despite this film falling in Lady and the Tramp‘s shadow. It is packed with much in the way of warm and cuddly anthropomorphism. It is drawn with a nicely outlined style and directed with a considerable degree of energy. It is particularly memorable for a number of sustained sequences – the All Dog Alert where the various canines manage to pass an APB for the missing dalmatians across England via a network of howls; some engaging slapstick sequences rescuing the dalmatians from under the noses of the two goons; and the long, nicely dramatically sustained flight through the snow from Cruella DeVille and the goons. It is a very likeable film. 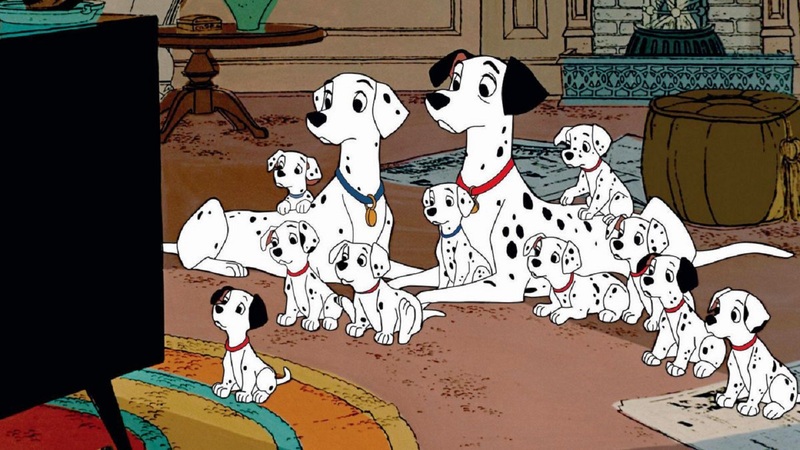 One Hundred and One Dalmatians was later remade in live-action by Disney and director Stephen Herek as 101 Dalmatians (1996), a move that proved disastrous. Comparison of the two is a sure demonstration of what makes this one work and the remake not. For one, the remake dispensed with any talking animals, which removed most of the sympathy and anthropomorphic delight out of the All Dog Alert sequences and the climactic flight. The remake instead concentrated on the romance between the far less interesting human characters – although this did emphasize the fact that the animated version seems uninterested in the humans – Anita hardly ever speaks and we, for instance, find nothing out about Cruella DeVille and what she does, nothing except her penchant for dalmatian fur coats. The remake also spawned a sequel 102 Dalmatians (2000), as well as an animated tv series 101 Dalmatians (1997-8). Descendants (2015) was a film featuring the children of Disney animated villains, including Cruella de Ville’s son.